Airports and the predicted future Aerotropolises need and will continue to need large storage and maintenance facilities for the airplanes that are the backbone of the international transport trade1. Airplane hangars represent a large untapped opportunity for EPAct tax incentives, as they are very similar in building type to warehouses 2, car repair bays3, industrial4, and self storage facilities5 in terms of building energy usage and their ability to drive large tax deductions, due to their large square footage. Hangars are ripe for taking the lead in energy efficiency because they are large simple spaces where large energy and tax savings are easily achievable by installing current generation energy efficient building products. Similar to warehouses, the largest hangars use electricity that also goes to support nearby major population centers where electricity is often supply constrained and expensive which greatly increases the economic return from energy efficiency measures. In conjunction with the growth of airports, the production and support facilities that are used to produce and maintain these aircraft will need to be retrofitted and upgraded to current generation technology. Lighting is generally the largest portion of hangar energy use. Standard prior generation lighting for hangars was T-12 or metal halide lighting. T-12 and metal halide lighting are some of the least energy efficient types of lighting as compared to today's T-8, T-5, induction and LED lighting. A lighting retrofit can easily reduce lighting electricity costs by 40 to 80 percent8. LED's and induction lighting in hangars that are heated only will kick in $1.20 and $1.80/sq ft tax deductions, where non-retrofitted hangars with metal halide and T-12 fixtures will not qualify for EPAct. 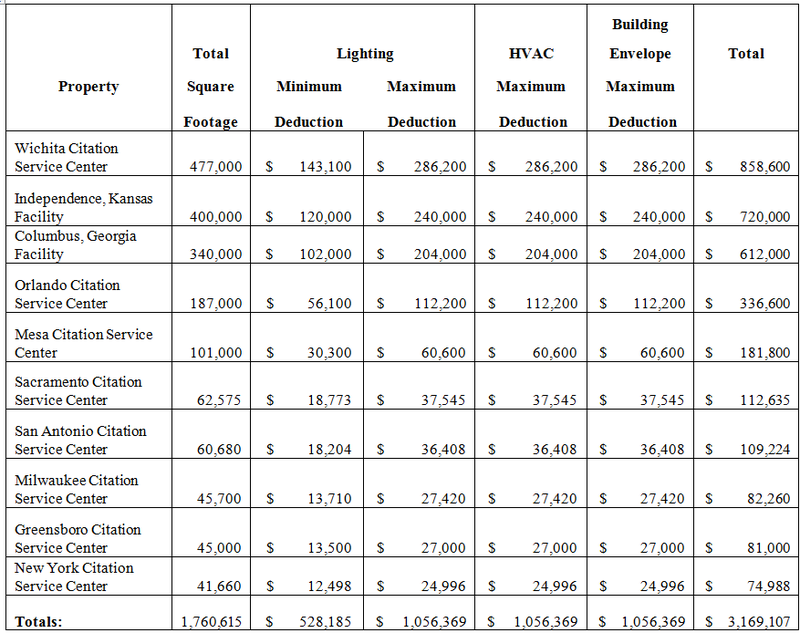 Section 179D utilizes building energy simulation models to confirm EPAct tax deductions. This software compares actual building systems to simulated reference building's systems. When a building models for just one system, HVAC for example, the actual project building would have reference lighting, reference envelope and actual project building HVAC. This would be compared to all reference systems in the simulated reference building. If this model, which holds all else constant, except for the HVAC can show a 15% overall building energy cost improvement versus the simulated reference building, the owner of the actual project building would receive $0.60/sq ft for the HVAC section. EPAct limits deductions to the lesser of what a project qualifies for, $0.60 or $1.20 or $1.80/sq ft or project cost. Most lighting retrofits, like the ones described in the previous paragraph, only cost around $1.00/sq ft. In these cases, if the full $1.80 is achieved, there is $0.80/ sq ft left over to apply to a roof EPAct deduction. The building’s underlying characteristics have already qualified for $1.80/sq ft but did not have the project cost. Now with additional project cost in a roof improvement, the remaining $0.80/sq ft tax incentive may be deducted. The key to utilizing EPAct for hangars most efficiently is to realize that retrofitting lighting alone is the key to qualify for large deductions. Once the efficiencies are achieved by qualifying the full 50% energy cost reduction versus the simulated reference building, just by retrofitting lighting, the remaining deduction above the project cost can be used to improve the envelope, in our example, the roof. 1 - Charles Goulding and Charles G. Goulding, The EPAct Tax Aspects of the Aerotropolis. 2 - Charles Goulding, Jacob Goldman and Joseph Most, Complete Tax Enhanced Warehouse Energy Efficient Design, Corp. Bus. Tax’n Monthly, August 2010, at 17. 3 - Charles Goulding, Jacob Goldman and Raymond Kumar, The Energy Tax Aspects of Car Dealerships, Corp. Bus. Tax’n Monthly, July 2009, at 11. 4 - Charles Goulding, Daniel Audette and Spencer Marr, The EPAct Tax Aspects of Resurging U.S. Manufacturing Investments, Corp. Bus. Tax’n Monthly, July 2011, at 17. 5 - Charles Goulding, Daniel Audette and Spencer Marr, Energy and Tax Savings Opportunities for Self-Storage Facilities, Corp. Bus. Tax’n Monthly, July 2010, at 13. 6 - Charles R. Goulding, Spencer Marr and Charles G. Goulding, Utility Tax Planning for Coal Power Plant Closures, Corp. Bus. Tax’n Monthly, June 2012, at 11. 7 - Charles Goulding, Jacob Goldman, and Daniel Audette, Advanced LEED Building Energy Tax Planning, Corp. Bus. Tax’n Monthly, December 2011, at 9. 8 - Charles Goulding, Jacob Goldman and Joseph Most, Complete Tax Enhanced Warehouse Energy Efficient Design, Corp. Bus. Tax’n Monthly, August 2010, at 17.